Here’s a Texas-sized wish for a great Independence Day! Thanks, Rob ~ we could stand to be a little cooler around here, so maybe my celebratory stars will help. I hear you, we’ve soared into the upper 70’s, whew. Thanks, Tina. Happy Independence Day to you! Many thanks to you all for the good wishes. One of my customers and his family just headed back to Norway for their annual visit with relatives there. I didn’t recognize the town name, so I don’t remember it, but from what I’ve seen of your photos, it will be beautiful no matter where they stay. That’s surely the happiest red/white and blue salute on the planet! 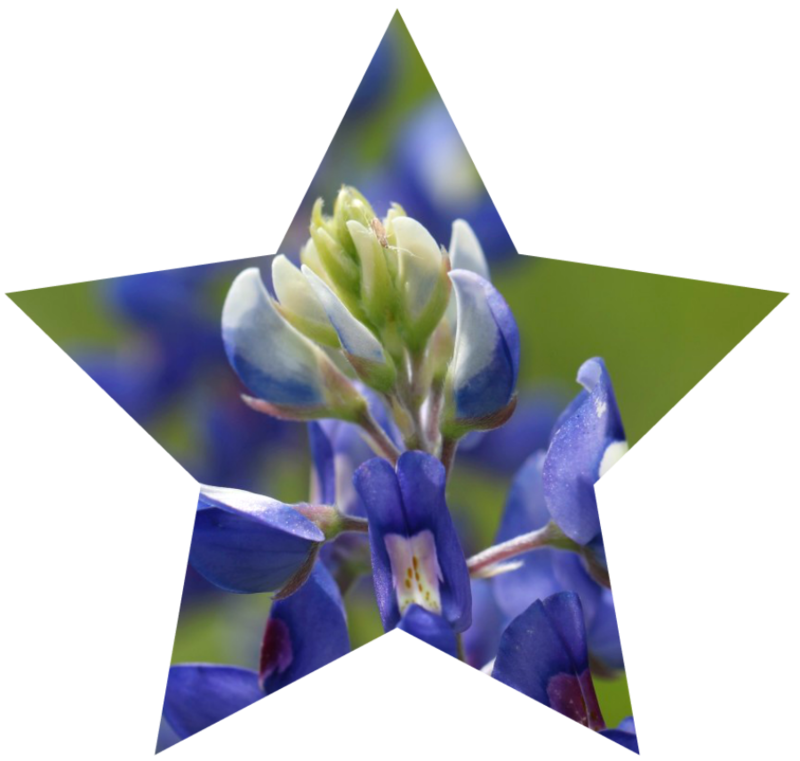 When I realized I had all three bluebonnet colors in my files, what else could I do? I have yellow and orange, too. Maybe I’ll save them for an autumn celebration. Perfect match – tic – tac- toe! Thanks, Terry. A happy Independence Day to you! As it happens, the photo of the red flower was taken at Wildseed Farms, so it makes sense that it would be the “Alamo Fire” variety. The white one was growing wild just outside the Deutschburg Community cemetery south of Blessing (where I found my first yellow one), and the blue one’s from the Willow City loop. Those Aggies are creative, but I have to say I prefer the red/maroon bluebonnet to their maroon carrot. Thank you, Linda! Since reading your blog and reading Empire of the Summer Moon, I’ve begun to hope that I might visit Texas one day and see all these beautiful things in person! I hope you do, Gretchen. It’s a wonderful state. The only caveat I’d offer is to try to avoid July and August when you come. It’s far more pleasant in the spring and autumn — and even winter can be beautiful. If you ever play with the idea of visiting, be sure and let me know. I know where we could find you a fine tour guide! I’m not much for celebrating holidays in general, but your stars definitely got me thinking about this particular holiday and how lucky we are despite whatever difficulties we face at the moment. Enjoy your 4th, Linda. Unfortunately, the fireworks around here don’t start until an hour past my bedtime, geezer that I am…actually, you know I am sure, it’s more about getting up at 4 in the morning. I thought about you the other day when Mia McPherson, a bird photographer, was ever-so-gently grumping about having to get up at 3 a.m. to make it to where she wanted to be to watch the birds in the morning. These long days are great, but they do have some disadvantages. I like the simplicity of the stars, and the way they join two traditional Texas symbols with the Stars and Stripes. Of course, I like July 4th generally — despite those difficulties you mention. But they’ll still be there on July 5th, waiting to be dealt with . Tomorrow’s a day to appreciate our history, and each other. I hope your day’s a good one! Early morning risings are tougher as we age generally. I don’t know if it’s the heat but they’ve been both harder and easier lately as I wake at 12:30-1:30 and toss waiting for 4 to arrive. I don’t always wait now and Bentley is willing to eat any time I get up. I am sure Mia will be happy when sunrise approaches a more civilized hour. Thanks for your greetings, Dina. I had to smile at your assumption that the blooms are current ones. The photos actually were taken at different times (the white one, two years ago) and at three different locations. They’ve been in my files ever since, while I figured out what to do with them. Then, inspiration struck — and here we are. As hot as it is, I’ll still take the heat over the mosquitoes. They’ve been laying low until the past couple of weeks. Now? They’re out with a vengeance — and so is my spray. Thus it ever has been. When I started reading the journals of people who traveled the Houston area in the 1800s, all I could think was, “How in the world did those poor people cope?” Then, I give thanks for AC, and quit whining. Perfect! Enjoy the day, Linda! Thanks, Lynn. I hope your day’s a good one, too. After getting out for an early morning wander, before the heat and the traffic build, I anticipate an afternoon in air conditioning. While all the office workers in the world gravitate to the outdoors on holidays, those of us who work outdoors always enjoy a chance to play the indoor slug — albeit with a book and a lemonade. I didn’t know blue bonnets came in other colors except blue! We are so fortunate here in America– even with our country in the shape it’s in right now. We moan and groan and whinge, but we have it so much better than so many parts of the world right now. There are so many people who don’t have a safe place to sleep. As you’re settling down to sleep in a soft bed behind locked doors, just stop a moment and think about what it would be like not to have a safe place to sleep. 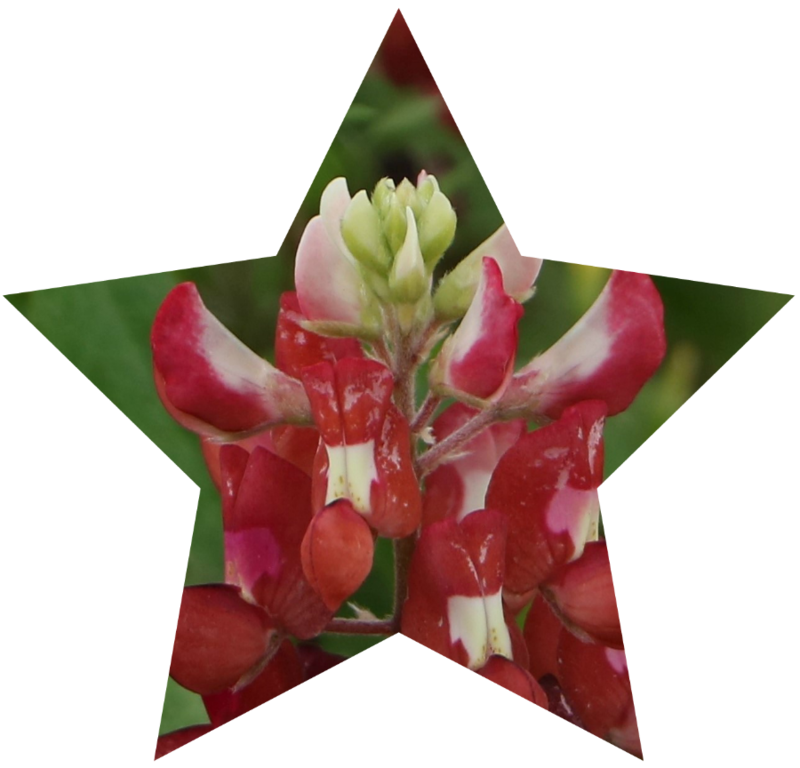 I’ve seen white and yellow variations of our Lupinus texensis, but the red ones are courtesy of the crew over at A&M. Here’s a short, fun explanation. I found the white one growing wild, but photographed the red ones at Wildseed Farms in Fredericksburg — where you also can find the seed, in case you’re interesting in trying some yourself. I just peeked at today’s headlines, and learning that North Korea’s launched an ICBM gives a slightly different context to you comment about having a safe place to sleep. But, yes: even on a local level, there are far too many homeless here, and far too many displaced elsewhere. Taking a few moments to reflect on that and other realities is one of the best things we can do on a day like this. Since things are bigger and better in Texas, I consider your wish wonderful! Thank you, and I hope you have a great Fourth. By the way, I didn’t realize bluebonnets came in reds and whites — are they still called bluebonnets?? They are. 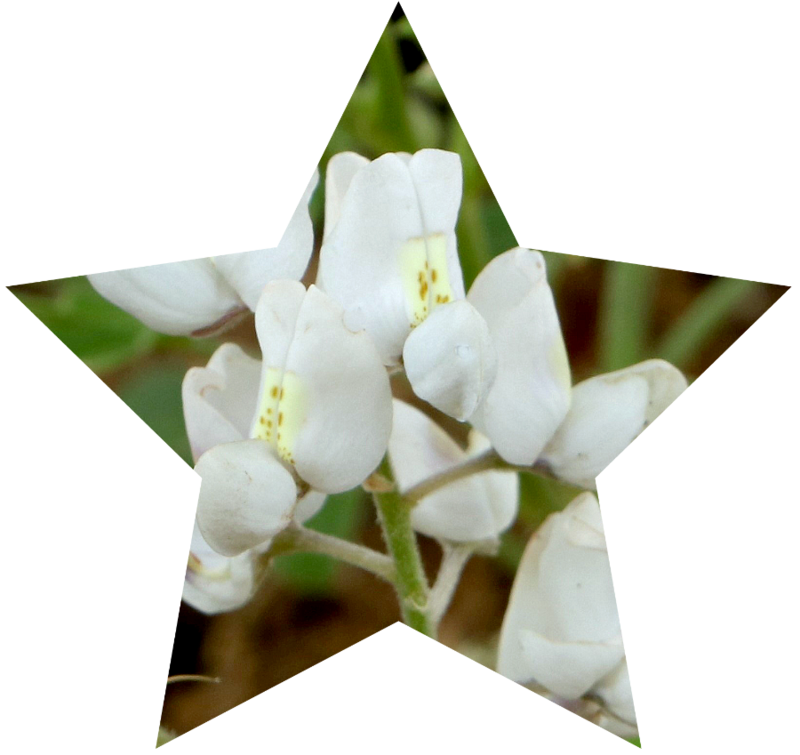 There actually are several species of bluebonnet native to Texas, each with its own scientific name. I couldn’t find the scientific name of any of the red ones, but I suppose it has the variety tacked on the end. People just call them red bluebonnets, or white bluebonnets. It’s a little strange, but no stranger than the white bluebells I found today. Sometimes nature doesn’t care what we call things. She’s going to make the changes she wants, anyway! Say hi to Domer, and enjoy the rest of the holiday/visit. This is just the perfect Independence Day post! I love it — the colors, the design, the whole thing! Best stars (no stripes!) ever! This is what passes for me getting “crafty,” Jeanie. I thought it worked really well, especially after I remembered I had all three bluebonnet colors in my files. I’m glad you like it. I have long contended that crafty does not require glue or snipping things or yarn. And you just proved it!